Man City were given a scare late on at Crystal Palace but Gabriel Jesus calmed their nerves with an emphatic finish to seal a 3-1 win. A double from Raheem Sterling seemed to send City cruising towards three points, but Luka Milivojevic’s brilliant free-kick in the 81st minute set up a tense finish. City certainly couldn’t afford to drop points in a fascinating and enthralling title race with rivals Liverpool, and Jesus ensured that they didn’t with a well-taken goal. 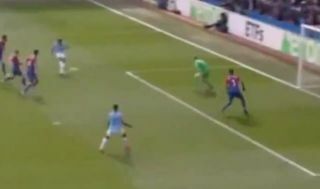 As seen in the video below, he was put in behind by Kevin de Bruyne on a Man City counter-attack, and the Brazilian made no mistake as he took his time and produced an emphatic finish to secure the victory. That now shifts the pressure onto Liverpool to respond against Chelsea at Anfield, with City going back top of the table but leading by just a point, albeit they will have a game in hand by the end of Sunday’s schedule.